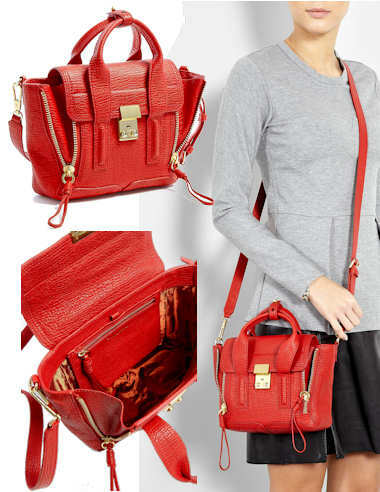 This 3.1 Phillip Lim Pashli Mini Bag is a new season bag in red grained leather. The bag has two rolled leather top handles with studded tab detail to hold them together and features gold coloured hardware throughout. It also has a removable, adjustable cross body strap. The bag is a flap over style with a studded gold push lock fastening on the front. It also has two zip fastenings down the front that can be unzipped to increase the size of the bag. These zips have looped knotted zip pulls. Inside, the bag is lined in red satin and there is a leather zip fastening pocket. Preppy and sassy, with a personality all of its own, this mini Pashli bag from 3.1 Phillip Lim is perfect for punctuating your off duty style with a bright and beautiful accessory.